The IWC-4-2 internal wire clip set includes two wire clips that are designed to secure our PVS-IS4 and PVS-RS4 vent screens inside any standard 4″ PVC hub or coupling. When using these internal wire clips, there is no need to use screws or adhesives to fasten our 4″ PVS series vent screens inside ordinary hub or coupling vent terminations. Each internal wire clip is made of 304 stainless steel, may be reused for many years and makes it possible to easily change our 4″ PVS series vent screens as seasons change. Both our PVS-IS4 4″ insect vent screen and PVS-RS4 4″ rodent vent screen models include one IWC-4 internal wire clip for an effortless and serviceable installation into any standard 4″ PVC hub or coupling with an inside diameter of 4.500″. This IWC-4-2 internal wire clip set includes two internal wire clips that may be purchased separately to have on hand as extras, to replace those that shipped with a prior order or to double-up existing wire clips for twice the retaining strength. 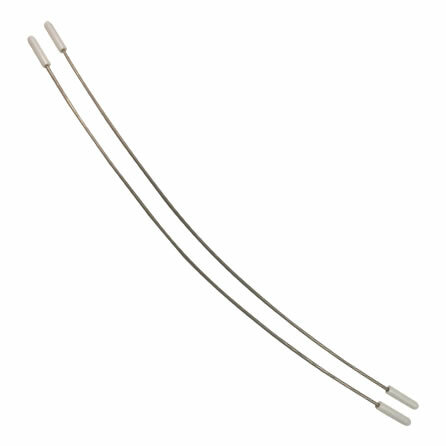 Each IWC-4 internal wire clip we sell is made from American grade 304 stainless steel to avoid corrosion. Additionally, each end of the internal wire clip is covered with a high temperature silicone cap. As with all of our internal wire clips, they may be reused indefinitely and are easy to install and remove when seasonal vent screen changes are necessary. IWC-4-2 wire clips are safe to use on both intake and exhaust ventilation terminations for a wide variety of applications including high efficiency boilers, furnaces and hot water heaters. However, there are many other industries outside of the HVAC profession that utilize our vent screens and internal wire clips which include agriculture, aquatics, plumbing and many others. As mentioned previously, every PVS-IS4 and PVS-RS4 vent screen we sell ships with a single IWC-4 internal wire clip. One internal wire clip is sufficient to hold our four inch PVS series vent screens inside a standard 4″ PVC hub or coupling, even when the vent is terminated in a direction pointing straight to the ground. Therefore, in most cases, it is not necessary to order the IWC-4-2 internal wire clip set unless you need to replace the internal wire clips that shipped with your prior purchase or have an application where the additional strength of using two internal wire clips per intake and/or exhaust vent is desired.